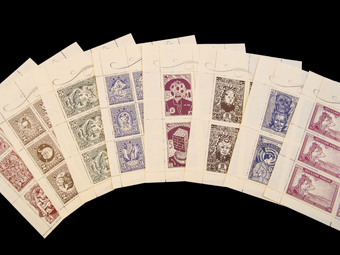 making vintage Stamps / paper / gumarabic ??? As you may have seen on previous posts I am stepping up -perforating and stamp projects. The biggest deterrent is the lickem glued backs. I have made them by hand, but it is a long and not practical task, any Ideas would be helpful. I currently use laid label paper 60-80g. I brush on the liquid gum arabic and let dry, it buckles some, so i must press it in a book press with wax paper before printing. I thought of silkscreening sheets but has the same pressing problems. 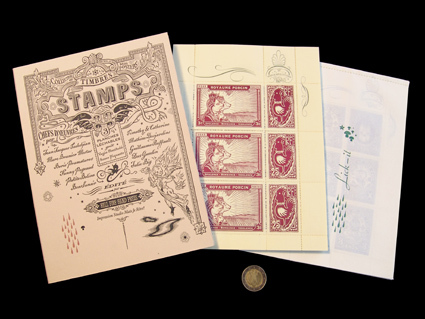 I don’t want to use sticker paper as the selection is not very good and doesn’t have the same feel as classic stamps. I tried to source gum arabic label paper but can’t find any in europe. If you can’t find pre-gunned paper, another option is a label pasting machine. Here in the States we have Potdevin machines but I expect there are equivalents in Europe. Basically they turn a roller through a reservoir of wet glue and run a sheet of paper across the roller. I have a couple of small, antique, hand-crank ones that I use to apply PVA to duplex cardstock. Michael — where did you find your hand-cranked glue machines? Were they more affordable than their automatic/powered counterparts? I would love a glue machine of some kind but don’t quite have the funds..
Mephits - do you think it the roller style would work for 80g paper without too much buckling? I found the antique Potdevins online. I think the first one came from High Bids Win and the second one came from eBay. I don’t think I paid more than $50 for either of them. As for lightweight papers like 80 gsm buckling, I think it would depend on the amount of water in the glue but I don’t know for sure. I’ve never used mine for anything but cardstock duplexing. These kind of machines were definitely used for putting paste on the back of labels, though, so it should work. You’d probably want to run as dry a glue mixture as you could. You would just have to experiment to see what works. Below is a link to a photo of me using one of ours. I’m not sure if this is helpful for you in Europe, but perhaps there are equivalent materials available from suppliers there. 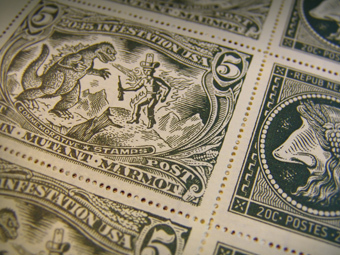 Your stamps look amazing…some of the best work I’ve seen. If you don’t mind my asking, how are you doing your perforating? Why go to Uk than you can buy Made in USA? Why go to the U.K. when You can buy in the U.S.A. ? The weight of the stock is 105gsm. tom- you asked about the perforations- I did them with a really old hand crank table top machine, more than 100 years old for sure. It is what started the project. It did not work to well only 3 sheets at a time and had to back with a carton stock. 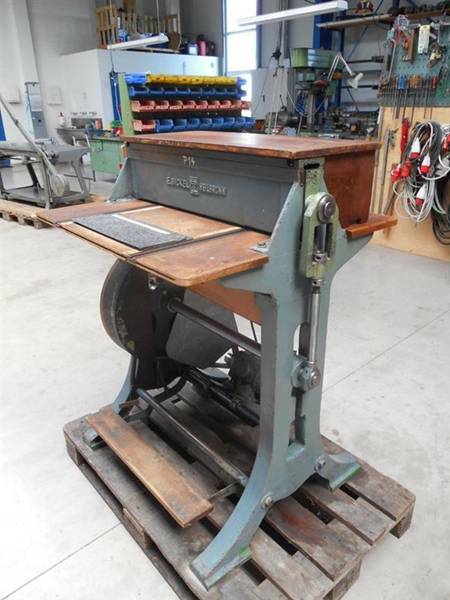 Since then I have purchased a Beckel I think maybe from the 1950’s its pretty used, but has a few different tools for creasing an perforating different size holes. I haven’t got it running yet, need to do a little electrical work. Thanks for the details on perforation. I’d like to be able to work at the quality level you achieved, but without the investment (mostly in workshop space!) in a full size perforating machine. I don’t aspire to making a huge volume of work, so perhaps something like your tabletop machine would suit me. I’ll have to keep on looking!